Case in point. Many on social networks are ensuring that people get out to vote in upcoming midterms and primaries. This certainly makes sense and every conservative out there should want to do what they can to ensure that more true conservatives are elected to government positions. However, in spite of this, seats have been lost to those on the Left. At least part of the reason has to do with the fact that voter fraud exists. We know that in Pennsylvania alone, documentation shows that there are at least 100,000 illegal aliens voting there. Moreover, the voting machines are quite possibly changing votes and are being investigated. In these instances, aside from complaining to the authorities, there is really nothing that the average person can do to correct the problem. The federal government needs to do what they can to ensure that only people who are legally allowed to vote, get to vote, and only once. Until this problem is resolved, we have to sit back and wait for those who can do something about it, to actually do something about it. I’m sure Q has considered this and I’m hoping there is a plan in place to correct this problem soon. In some ways, it feels like Q is simply wanting us to come along with him (or them). He wants us to be part of what’s happening. Q could not have ever said anything, but chose to include us in the process. This at least keeps us informed and we can try to direct things through our social network accounts. Aside from that I’m not really sure what can be accomplished. Of course, we need to be in prayer as well. God will gain the victory He intends to gain, irrespective of whether or not it tends to fulfill our dreams of what we would like to happen. There have been three Q posts this morning and I don’t understand them all, but will try to do what I can. The first post starts with “The FBI opened a case on ‘Q’ today re: ‘Boom’ statements and now the TX bombings.” That seems clear enough. Previously, Q posted several statements that included the word “BOOM!” So naturally, the FBI thinks that these “booms” foretold of the Austin, TX bombings, right? A bit absurd since it is most likely that Q’s reference to “booms” was metaphorical, not literal. It’s difficult to trust the FBI with the likes of Comey, McCabe, Strzok, Page, and others who have diligently worked to overthrow a duly elected president. The corruption appears to run very deep, but you’d never know that from MSM (Mainstream Media), because they have one agenda and that’s all they push: bringing down President Trump. Some even believe that the TX bomber was a false flag (deliberately set up), to bring attention to the Q boards to bring down the “truther” boards on 8Channel boards. We know very little about the suspect in the TX bombings, who was killed early this morning after being cornered by police. It is not know whether the bomb he detonated or the shots fired by police killed him. Gov Abbott has stated that his social network pages have provided a treasure trove of information that will probably take weeks to go through before we find out anything definitive, though we can assume that the Leftwing media will put out all sorts of flaky narratives in an attempt to derail truth before that truth can hit the airwaves. Q continues by stating that the “case” the FBI opened on Q is designed to “end comms here,” meaning they want Q to go into hiding and stop posting. I doubt seriously that Q will do that. In fact, his next line – “Predictable” says as much. The next line, “They are scared [4am]” is referring of course to their state of mind. How does Q know this? Because of the talking points that are still being generated to the MSM at 4:00am each day. Q has told us before that they see everything. They see their talking points. Q then states, “They will fail” and “We know the details.” Q has their information and is already ahead of them. Q’s last line of this post is [Wednesday], which of course, is today. The implication is that something big is going to happen today. From the picture of Q’s post from last week – March 17 – we can see Q was giving everyone a huge heads up about this week. He says “Next week. BOOM BOOM BOOM.” Next week is now here and Q has narrowed it down for us to let us know that today, something big is going down. Will it be the hotly anticipated Inspector General Report? It was supposed to be out during this month of March, so we’ll just have to wait and see. Q’s next post from this morning – #959 – is a long one. Last week, Q issued a rather longish post as well, detailing the level of corruption at the FBI, the DOJ, and the State Department. Pretty sad when considered. But regarding Q’s post here, notice it starts with “MZ” then “RT.” Doing some research, it appears that the MZ likely refers to Mark Zuckerberg, CEO of Facebook. Q has referred to him before. What is interesting is what has come out recently with respect to Zuckerberg and others in high places at Facebook. Together, these people have sold thousands of shares of FB totaling millions and it was done just prior to the information coming out about FB and how data was mined by ad agencies without users’ permission. The meeting was so important all cell phones were left outside the room. Why? So nothing could be traced; microphones inside phones couldn’t be remotely activated. In spite of this, Q knew who was meeting and even tells us that one individual was a “former intel dir” as in Clapper or Brennan, who headed up NSA and CIA respectively. They met with five politicians for the purpose of creating “spin” to change the narrative. They will use the MSM to support their talking points getting out disinfo to the American people via the “news.” It will all be an attempt to “shift narrative” but they will “FAIL” miserably. Q then says “We hear you. We have the algorithm. Thank you @ Snowden.” There is nothing said in secret that Q team does not intercept. The algorithm noted here is the one that is used to shift narrative by “bots” on social networks. Q sees the algorithm and knows how it works. They will actively engage it to cancel its effects. Q then goads those on the Left who are doing everything they can to create a successful coup against President Trump that they need to learn to play “chess.” Q is talking about 4D chess here and Q team is always steps ahead of the opposition. They are always having to respond to something because of it. “Down she goes” may refer to Hillary Clinton, which would be very nice. 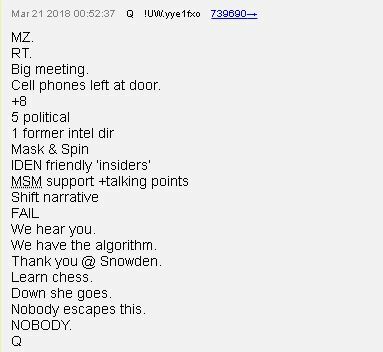 Q ends with “Nobody escapes this. NOBODY.” One thing I’ve noticed (and others have as well), is that in spite of the fact that we live in a highly technological digital age in which news, spin, and actual facts are disseminated so quickly throughout the world, yet government continues to move at a snail’s pace. It’s sometimes difficult to deal with because we wonder why for instance, the IG report has not been released yet? Supposedly, it is going to disclose many things that have been hidden by our government, during the Obama administration. So why isn’t it out yet? I’m sure there are reasons but in truth, it is frustrating on one hand, while on the other hand, it must mean that the average person who follows Q’s posts is more of an observer than anything else. Q is keeping us posted but the ball is always in his court. 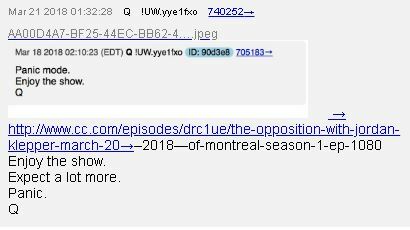 I watched a bit of the episode and it’s simply an attempt to ridicule Trump and those who tend to follow Q’s revelations. It’s similar to Stephen Colbert and even Jimmy Kimmel to an extent. In essence, these individuals are doing what they can to change the narrative by presenting “news” in a comedy format. In doing so, people laugh at what appears to be the humor in all of it, making it that much more difficult to believe. The problem of course, is the way in which these individuals choose their words and how they frame their “stories.” They deliberately leave pertinent facts out but the average person doesn’t attempt to fill in the missing information since they do not recognize that anything is missing. For instance, the big news these days is on Stormy Daniels and her apparent tryst with Trump some eleven years ago. Compare this to Bill Clinton’s sexual liaison with Monica Lewinsky while he was married to Hillary and while he was president of the United States. At the time, I didn’t really care about Bill’s sexual proclivities. It’s not as if he was the first. I felt at the time it was between he and his wife. That is, until he lied to Congress about it. Then it became a problem for which he was impeached, though there were not enough votes to actually remove him from office. The Left wants to make Trump’s sexual liaisons an impeachable issue. It’s not. But it is ironic to see the Left all of a sudden become so “moral” in their thinking. It’s simply a ruse. What Donald Trump did years ago is not my concern. He’s not my pastor. If we’re going to start insisting that politicians honor their wedding vows, we need to go back quite a ways in history. I voted for Trump because I want some changes to the lawlessness that has grown under the Obama administration and those before that. This is really our last chance, quite frankly. If nothing changes, then it will be due to the fact that God did not want it changed. I have a tough time believing that though because if God did not want changes, He could have easily not had Donald Trump win. Time will tell what’s going to happen. I wish things moved faster but maybe they are and I simply cannot see it. Hopefully, today, something will occur definitively. The reference to Wednesday could refer to the bomber’s death that occurred this morning (since the Q post was posted at 12:21AM EST), or could refer to something else entirely. We shall see. Entry filed under: 9/11, Agenda 21, alienology, Atheism and religion, Barack Hussein Obama, Communism, Council on Foreign Relations (CFR), Cultural Marxism, Demonic, devil worship, Emotional virtue, eternity, Global Elite, Gun Control, Political Correctness, Politically Correct, Politics, Religious - Christian - End Times, Religious - Christian - Prophecy, Religious - Christian - Theology, salvation, Satanism, Trilateral Commission. Tags: 8 chan boards, anonymous, austin tx bomber, q, Q anon, q posts. Thank you for your updates. Thank you Q for your hard work. I pray the lord protect you and stirs the hearts of men to get out of their comfort zones and be real men for Christ and for morality. What is real disheartening is the fact that Pastors; are turning the title of pastor and changing it to passive. No urgency for prayer for our President or the men battling with him. We sit idle week after week in our comfort zones, while the country gets invaded by the NWO. Here in Oregon, the pastor that is getting involved wants to ban all firearms with large capacity clips. basically, equipping us with peashooters. The pastors here are tainted and have lost their way. i will fight for our god gifted constitutional rights. I will fight for morality. Let me know how i can help. Thanks for your comments. I do not understand how some think, frankly. Guns exist. Outlawing or banning some will have effect in criminals or mentally ill and their ability to get a gun.